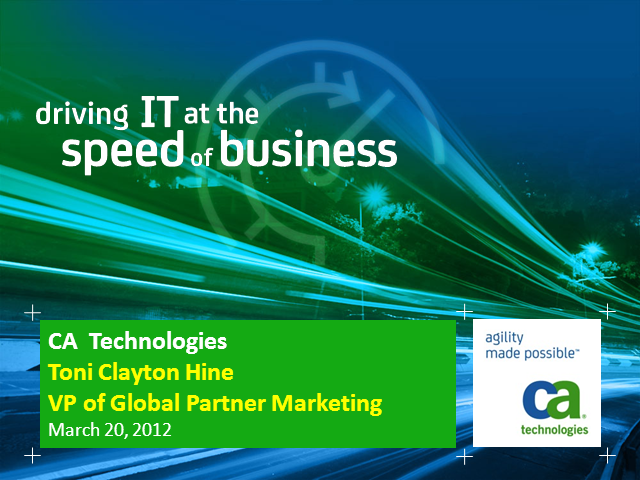 How CA Technologies is empowering partners to transform themselves in the new world of cloud computing. Your channel partners are fighting to maintain relevance as IT spending remains flat and end customers seek out cloud services to meet the rapidly changing needs of their businesses. Learn how CA Technologies is leveraging its partner sales and marketing expertise to help its global partner ecosystem transform to meet the changing needs of their end customers. Toni Clayton-Hine, VP, Global Channel Marketing, will detail CA Technologies innovative Cloud Choice Simulator program, a game-based role playing simulator. Partners gain hands-on insights into the challenges their IT customers face in migrating services and apps to the cloud. As channel partners look to extend their status as Trusted Advisors, what tactics and campaigns are delivering results now? Don’t miss this one.